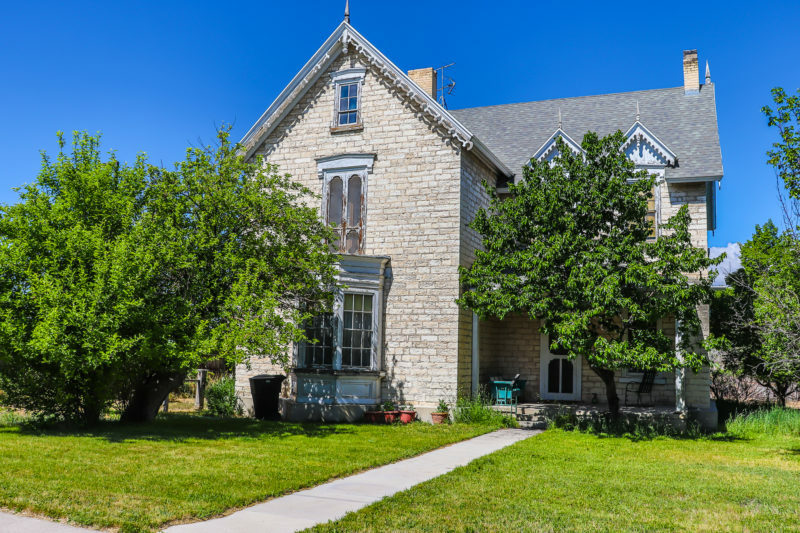 Built with oolite stone, the Greaves-Deakin home in Ephraim was one of the first, if not the first, Sanpete County residence designed in the Gothic Revival style, a style popular in the late 1870s and 1880s. The stone mason was Jens Christian Breinholt. Tanya Isbell Anderson, a niece of the last owner, listens while her mother, Anita Deakin Isbell (seated), 91, recounts some of the lore of the house. Anita was born July 26, 1927 in the very same bedroom where her own mother, Maud Greaves Deakin, had been born 45 years earlier on June 30, 1882. 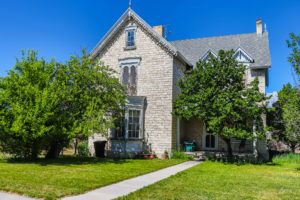 It was the first house in the Sanpete Valley designed in what was known as the new Gothic Revival style, a style that was in vogue in the late 1870s and 1880s. It was also the tallest home in Ephraim, possibly all of Sanpete County, with two floors and a full attic (in addition to a basement.) 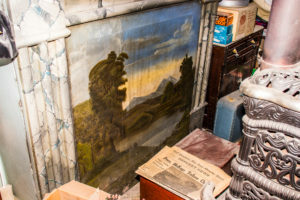 Even today, the home’s venerable exterior and interior, its faux painted mantels, its original oil paintings, the brass fixtures and the fine furniture from manufacturers “back East,” evinces a prosperous and comfortable lifestyle for the time in central Utah. Nowadays we would call it “the dream home” of Peter Greaves and his wife, Elisabeth Motley. For the industrious pioneer couple, it became their final home, the place where they finished raising their family, grew old together and eventually died, surrounded by loved ones. Before moving into their grand home, eight of Peter and Elisabeth’s nine children had already been born in more humble circumstances. Despite the heartbreak of losing three of their nine to childhood illnesses, in the true pioneer spirit, the family spent their evenings together, often singing and playing musical instruments. As a result, if the walls of the home could speak, they would not simply talk but also sing. By all accounts, Peter and Elisabeth gave their offspring an abundance of musical genes. Peter was said to have “perfect pitch,” and both he and Elisabeth encouraged their children to sing and learn to play a musical instrument. To that end, the parents turned an upstairs bedroom into what they called “the band room.” Thanks to an exterior door, which opened from that room onto a porch above the front porch, the young musicians could step outside with their instruments, weather permitting, and perform for the appreciative audience, which gathered below along the ditch bank to enjoy what became weekly performances. Few details about the Greaves family band have survived. It is known that the oldest son, Peter, Jr., played the cornet, and his younger brother, John, the trombone. Some sources credit cornet-playing Peter, Jr. with starting and leading the first community band in Ephraim. Peter, Sr., son of Thomas Greaves and Dorothy Gescal of Lancashire England, was born Aug. 26, 1836 in Patterson, New Jersey. He came to Utah in 1852, in his teens, with the Howell Company of Mormon Pioneers. A couple of years later, he arrived in Ephraim. 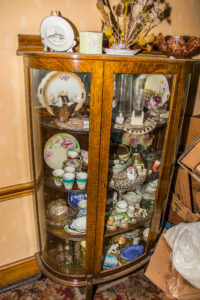 Fine furnishings, including designs inspired by Charles Locke Eastlake, an influential British artist and furniture designer in the mid-1800s, were imported from “back East” to fill the Gothic Revival home of Peter and Elisabeth Greaves. Quickly putting down roots, Peter became a force in helping Ephraim become an established community. In addition to homesteading and farming, he ran successful businesses, including a small general store which was located, for at least a while, in the bay-windowed parlor of the Gothic Revival home. 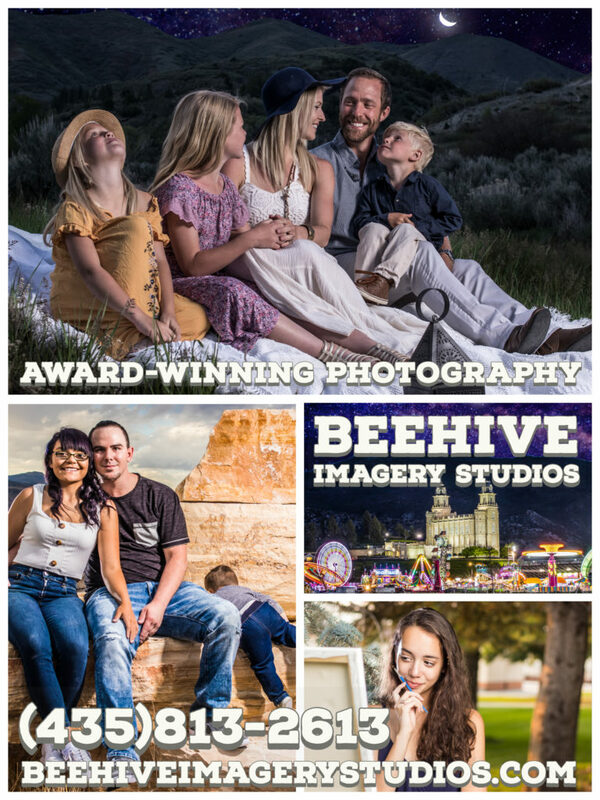 Peter’s service to the community included eight years as a member of Ephraim’s first city council, chairing the Sanpete County Commission for two years and serving as a senator in Utah’s last territorial legislature. Elisabeth, the daughter of William Motley and Elizabeth Hughes, was born June 10, 1837. Like her future husband, Elisabeth came to Utah as a teenage pioneer. Elisabeth, her mother (who was also named Elizabeth, but spelled with a “z” rather than an “s”) and a sister came to Utah together after the death, in Nauvoo, of their husband and father, William. In Manti, on June 20, 1858, just 10 days after her 21st birthday, Elisabeth married Peter Greaves. Respecting his wife’s wishes, Peter never practiced polygamy, though his financial success and church standing would have made him a candidate for the practice. Losing three children to illnesses motivated Peter to become a life-long student medicine. As a result, besides being a businessman and civic leader, Peter became a trusted resource for medical information. Although six of the couple’s nine children lived in their new home, only one was actually born there: their youngest daughter, Maud, on June 30, 1882. 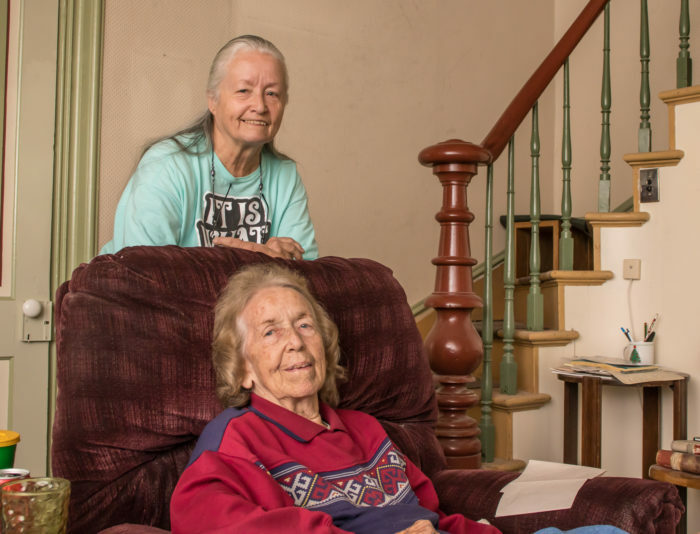 Some 30 years later, when Charles Fremont Deakin of Wellsville, Cache County, met Maud in Ephraim, she was living in her childhood home and caring for her infirm, widowed mother, Elisabeth. After their marriage, the couple lived in the Greaves home so Maud could continue carrying for her beloved mother. At the same time, Charles and Maud started raising their own family of four children. Upon Elisabeth’s death in 1917, Maud inherited the home, and soon afterward invited her husband’s aging father, William Price Deakin, to live with the family so she and Charles could care for him. William accepted the kind invitation and spent his last days in the home. When Charles and Maude Greaves Deakin died, the house stayed in the family. Charles passed away first. Then Maud had a stroke. One of the Deakin daughters, Cathleen, who wasn’t married and who was teaching school in another city in Utah, came home to care for her mother. When Maud died, Cathleen stayed in the home until she herself died in 1915. 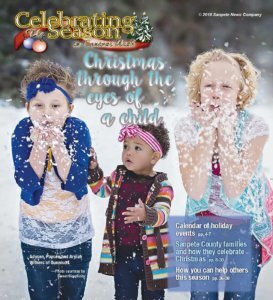 Recently, during Ephraim’s 2018 Scandinavian Festival weekend, the youngest and only survivor among the four Deakin children, Anita Deakin Isbell, (Cathleen’s sister) and her older daughter, Tanya Isbell Anderson, happened to meet the publisher of the Sanpete Messenger, and invited her to send a writer and a photographer to tour the historic home. They were in town partly to get the home, which is listed on the National Register of Historic sites, ready to go on the market. The wood on this mantel has been faux painted to resemble marble. Another fireplace in the home is currently obscured by an oil-painted rural scene, possibly by the famous Mormon pioneer artist, C.C.A. Christensen, who lived outside Ephraim and whose daughter was a close family friend of the Greaves. 26, 1927, it was in the very same bedroom where her own mother had been born some 45 years earlier, on June 30, 1882. Compounding the coincidences, Anita also noted that she was the last child of Charles and Maud Deakin, while her mother was the last child of Peter and Elisabeth Greaves. In 1891, some 20 before his death, Peter, Sr., deeded to each of his three sons a parcel of land in what was then known as “Greaves Block,” originally homesteaded by Peter Sr., which took in a big part of what is now “downtown” Ephraim. It stretched from Main Street to First West and from 100 South to 200 South. All three sons built homes on Main Street or in the vicinity. In that home, the younger Peter Greaves raised his own family, was a school teacher, principal, school district superintendent and city recorder. He also served on the Ephraim City Council before his death in 1923. The home built by his younger brother, John, was also on Main Street, was on a parcel of land on the west side of the street approximately halfway between 100 South and 200 South. Years later, that home, along with another home that had been converted from a wooden granary, was torn down. The site is now used by the Jorgensen Chevrolet dealership, which has its showroom on the other side of Main Street. Son and brother, number three, Albert or Bert, built his home, which can still be seen, on the south side of 100 North approximately halfway between Main Street and 100 West. Over the years, other homes have been built on the block, including a long deserted bungalow on the north side of the grand Gothic Revival home. The little home is from a more recent era, but like its statelier neighbor stands in need of some tender care. Tender loving care is something the Greaves-Deakin home generously brought to family members, friends, neighbors and strangers over the years. Hopefully, when the home is sold, its new owners will honor and continue its wonderful legacy. 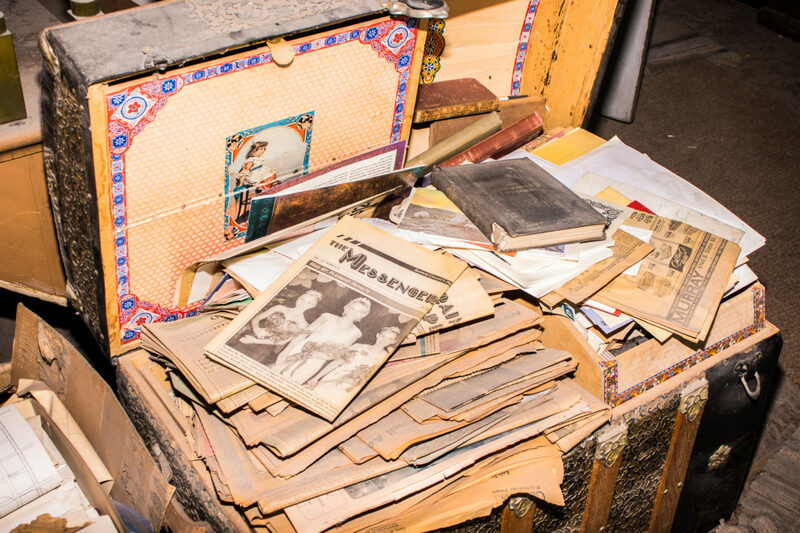 This chest of books and newspapers, including an old Messenger-Enterprise, is one of the scores of artifacts Anita Deakin Isbell and her daughter, Tanya, are finding in the historic Greaves-Deakin home as they clear it out so they can put it on the market.